The five presentations herein, along with the embedded video player and sub-menu assets focus on some most the important core concepts that shape physician professionalism and ethics in 21st clinical medicine. Factors highlighted in the series include medical oaths, codes of ethics, role models/mentors and their impact on the professional attitudes and conduct of junior physicians, bioethics and medical ethics. cases, along wth questions and answers are included for discussion. IVMS Shaping Professionalism: AMA Medical Professionalism I by Marc Imhotep Cray, M.D. 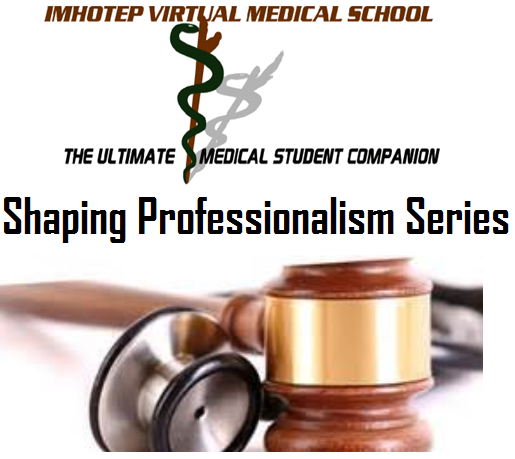 IVMS Shaping Professionalism: AMA Medical Professionalism II by Marc Imhotep Cray, M.D. IVMS Shaping Professionalism: Bioethics I by Marc Imhotep Cray, M.D. IVMS Shaping Professionalism: Bioethics II by Marc Imhotep Cray, M.D. IVMS Shaping Professionalism: Bioethics III by Marc Imhotep Cray, M.D.